The discovery and proposed exploitation of a natural gas dome containing methane and some of the highest concentrations of helium in the world – South Africa’s first onshore gas find – in the Free State has created much excitement and visions of a local gas hub. “The Free State now has the potential to pioneer the local gas economy, show South Africa the benefits of this gas find and that the gas can easily integrate into business,” says AltX-listed alternative energy company Renergen CEO Stefano Marani. But what are the origins of this helium-rich resource? Several theories abound about the source of the gas, also known as methane. The gas of this natural gasfield is believed to derive from abiogenic and biogenic hydrocarbons associated with ancient fissure waters, coal beds or ancient algal mats, according to research conducted by geologists. Regardless of the source or genesis, the methane gas is clearly located along major and minor faults. Another key belief is that the asteroid impact in the Witwatersrand basin about 2-billion years ago, which formed the Vredefort Dome, in the Free State, assisted in bringing uranium and thorium into the basin. Helium is believed to have been derived from the natural radioactive decay of these heavy radioactive elements. The naturally occurring methane acts as a carrier to bring the helium to the surface, resulting in gas concentrations of between 3% and 4%, at levels as shallow as 400 m, and well above some of the gold mining operations in the area. The natural gas of the Welkom goldfield was first discovered in the Virginia gold mine in 1947 and the mine has been emitting combustible gas ever since, according to professional services firm Venmyn Deloitte. “This natural gas, with affiliated helium, has since been recorded as being emitted by surface drillholes . . . faults and cracks in all the underground mines of the goldfield,” the company notes. Based on additional anecdotal reports, gas intersections were first made when miners explored for gold on the Free State portion of the Witwatersrand basin. The drilling of cores led to additional discoveries of natural gas, with a hit ratio in terms of drilling for gold and striking gas being significantly high. Once the gold shafts were established and mining operations undertaken, historical evidence indicates that the Welkom goldfield had mines that were classified as fiery – mines that have traces of methane and had explosions in the past. “Gas has accumulated and found its way through the faults and fissures; we have also come across puddles of water containing methane gas in the area that have been ignited in the past,” adds Renergen COO Nick Mitchell. Highlighting the relevance of helium, geologist PJ Hugo and the then South African the Atomic Energy Board disseminated scientific papers in the early 1960s, including the ‘Helium in the Orange Free State goldfield – a nuclear raw materials investigation primarily for the Atomic Energy Board’, published in 1963. Hugo’s other publication, ‘The Evander gas-field’, published in the Bulletin Geological Survey of South Africa in 1964, also includes suggestions that the methane which occurs in the Witwatersrand strata is believed to have been derived from distillation of coal or carbonaceous shale by intrusion of dolerite. While there was no historical exploration for gas in the area, exploration company Highland Exploration (held jointly by Molopo Australia and Foree International) was awarded six exploration rights in 2007 for petroleum, with a special provision for gas in Virginia. Later that year, Molopo Australia acquired the remaining 50% of Highland Exploration. Another three exploration rights were awarded to Highland Exploration in 2008. The drilling of the first three wellbores – HADV1, HADV2 and HDR1 – started in the same year and was completed in 2009. Molopo Australia sold Highland Exploration in 2012 and the company was renamed Molopo South Africa Exploration & Production later that year. Molopo South Africa Exploration & Production was granted a gas production right that is valid for 30 years by the Petroleum Agency of South Africa in September 2012. The company also holds five exploration rights. In 2013, Windfall Energy acquired Molopo South Africa Exploration & Production, which, in turn, was acquired by Renergen in November 2015 in a deal valued at R650-million. Molopo South Africa Exploration & Production, now known as Tetra4, is a subsidiary of Renergen and 10%-owned by a black-empowered entity led by Cheryl Sjoberg. Negotiations are under way with PetroSA to facilitate 10% State participation in the production right. Tetra4 is the holder of South Africa’s only onshore production right, which covers 187 000 ha and spans the Free State gold mining towns of Virginia, Theunissen and Welkom. The company has drilled and continues to drill wells to tap the natural gas source dome while ensuring minimal visual and environmental impact. To realise the potential of the gasfield, Tetra4 entered into an agreement with JSE-listed gas provider African Oxygen (Afrox) and Germany-based The Linde Group in May this year for a significant investment in the commercialisation of the natural gas resource and the creation of a large helium production facility. Tetra4 has contracted the helium offtake in the form of a life-of-plant take or pay agreement to The Linde Group, while Afrox will operate the processing plant and market the helium. The Linde Group’s US-based global helium and rare gases unit will market any surplus helium not sold by Afrox in South Africa and the rest of the Southern African Development Community. The Free State helium will be sold by Linde at global prices, as helium is a globally traded commodity. 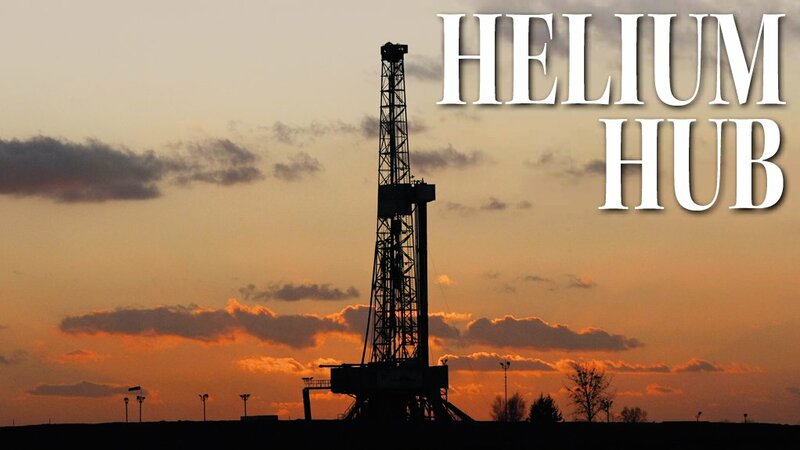 Current proven reserves of natural gas and helium are about 25-billion cubic feet, Engineering News reported last month. The helium processing plant will use The Linde Group’s patented helium separation technology and is expected to have a nameplate capacity of 650 000 m3/y . Linde’s extraction technology will separate helium from natural gas through a single system using a patented processing plant that purifies, compresses, liquefies and stores the helium. Linde Engineering has started detailed design work on the modular plant, which will be manufactured in Europe before being shipped to the Free State. Marani says that, subject to design, the plant is expected to start operations in 2019. For Afrox, the investment will facilitate the first domestic supply of helium, currently imported at a rate of 180 000 m3/y, adds Afrox MD Schalk Venter. Afrox sales and marketing GM Nazmi Adams agrees, highlighting that the certainty of a new helium source will enable Afrox to replace imports with locally produced product and reduce the logistics costs in shipping the cryo containers over extensive distances. The company currently supplies about 30 t of helium a year to the South African market. “Another key benefit is that Afrox will be able to grow its market locally,” he adds, noting that the largest market for helium currently is the use of liquid helium to cool the superconductive magnets in magnetic resonance imaging. Helium is also used in the welding industry as an inert shielding gas for arc welding, in various types of gas lasers as a buffer or carrier gas, in mixtures for neon signs and for breathing apparatus used in diving, as a gas used in party balloons and in large balloons for upper atmosphere studies. The gas is also used as a calibration gas, to balance gas calibration mixtures and as a reactor coolant in nuclear reactors. While current helium prices are about 100 times the price of oxygen, the current global helium growth is expected at just below single digits a year, Adams further points out. Tetra4 will complete the environmental-impact assessments and secure the necessary approvals this year to connect all existing wells through a pipeline 2 m below the surface on predefined servitudes to allow for all the gas to accumulate in one specific location where the helium can be separated. Subject to the environmental approvals, Tetra4 will start construction of the pipeline and a larger facility to accommodate all the gas. Tetra4 will also further engage in drilling additional production wells. The company has already started drilling a new series of production. It has additional exploration rights in Virginia and Evander, which it aims to take up the development curve. Once the Helium is removed from the gas stream, the remaining gas is high concentration methane, which is ready for compression and can be used in liquid fuel replacement or substitution. Renergen is exploring markets for the balance of the natural gas in the Free State gasfield, as it can be used in thermal applications, heating, cooking, electricity generation and manufacturing. Nevertheless, the helium agreement remains a significant focus for Renergen, as helium is a valuable commodity. “It might comprise a small percentage of the component of the natural gasfield, but it is a significant component revenue- wise,” Mitchell says. “While the gas operations won’t be significant enough to have a material impact on South Africa’s gross domestic product or State-owned power utility Eskom’s availability of power, Renergen will be able to provide energy in an energy-starved area, resulting in communities having an alternative energy source from within the Free State for the first time,” Marani says. Significantly, the natural gas can be used as a fuel for heavy-duty vehicles; therefore, the company’s plans for this year include supplying compressed natural gas (CNG) to a transport company in the region, which is converting its buses to use CNG instead of diesel. As part of Renergen’s business plan, and with capital invested by the parent company, Tetra4 completed the construction of its first natural gas compression station just outside Virginia last month. The station will be used to supply the CNG to logistics provider Unitrans subsidiary Megabus to power ten buses running on the gas. Mitchell explains that the compression station will process about 210 000 standard cubic feet, or about 210 GJ of natural gas a day, which will then be stored in 40-foot tube containers, known as skids. These will be transported to the Megabus depot and connected to a dispensing station to dispense the gas from the cylinders to the bus CNG tanks. The CNG buses will be used to service mining company customers and transport mineworkers in the area, specifically those of Sibanye Gold. Although Afrox is not a customer yet of the natural gas from Tetra4, Adams, nevertheless, believes this project is “well-timed” for creating the potential for the gas provider to build its capability and infrastructure into what would “ultimately be a far bigger play in the clean-fuel business”. He says “the prospects for the natural gas are just as exciting as the helium”, adding that the availability of such a reliable source means the possibility of developing a downstream natural gas business will create new markets – to some extent – and could eventually displace liquefied petroleum gas in other markets. “There is a long-term play for South Africa in truly becoming a gas market. This is the early steps of diversification towards that,” Adams concludes.